The secretary-general of the Richard Wagner Circle Bangkok, Mr. William Condie, has asked me to write a brief note to members of Wagner Societies around the world. 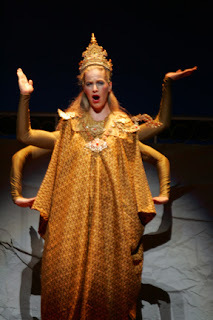 As many of you may have read, the Bangkok Opera, which is only six years old, mounted a five year plan to produce a complete Ring by the year 2010. The idea was to do a Ring that was a truly Asian interpretation, showing the universality of Wagnerís vision of karma and redemption. Our Rheingold, premiered last year, received a lot of international coverage and I am attaching some of the articles that have appeared around the world. We felt that, despite our distance from the Wagnerian centres of the world, that we actually had something new to say, and I think that the world of Wagner critics also saw this. Since Rheingold last February, I have mounted a number of large projects, but the Bangkok Opera itself, in spite of enormous critical attention, has found itself under attack; odd attempts at government censorship, a huge amount of “attack spams” directed against us by local claques, even anonymous faxes sent to members of the Thai royal family trying to say that we are somehow destroying the fabric of Thai culture. Indeed, the kind of “battle” we are fighting is not dissimilar to what Wagner himself must have experienced in the 19th Century. Despite more interest in the continuation of our Ring Cycle from music lovers in Thailand and around the world, therefore, this trailblazing Asian Ring is having a lot of difficulty. The secretary of our local Wagner Society has suggested that we write to sister societies around the world for help. The reality is that the amounts we try to raise are laughably low by European or American standards. Our entire annual budget, with which we put on five full scale productions each year, would only pay for the first act of Walküre for one night at the Met. Singers around the world have slashed their fees because of the artistic interest of appearing in this Ring. if we can’t find help, our vision of a Southeast Asian Ring Cycle may die. Mr. Condie calculated that if every member of the world’s Wagner Societies donated only 10 Euros to the Bangkok Opera’s Ring project, Die Walküre could be mounted without a single further sponsor or a single cent of government support. Of course, I do not expect that the world’s Wagner Societies would be the only financial supporter for this production. But I would like to urge all of you to consider making a donation, joining one of the tour groups that is coming to Bangkok for this production in July, and telling all your friends that there is still new territory left for Wagner to conquer. We want to make it as easy as possible for people to contribute, so attached to this letter you’ll find that Mr. Condie has drawn up all the information you will need. We will list everyone who donates 100 Euros or more in the programme book, and we will list every Wagner Society who helps us as a co-sponsor of the Bangkok Ring. Thank you so much for your attention and your support. And here is a little teaser from the 2006 production of "Das Rheingold"